August is here and people from all over the country are visiting Topsail Island. I will be in Surf City all month long documenting the fish being caught here. Be sure to see the July 2018 Fishing Report also. Prime season for surf fishing is usually April/May and October/November, but there are fun fish to catch all year. 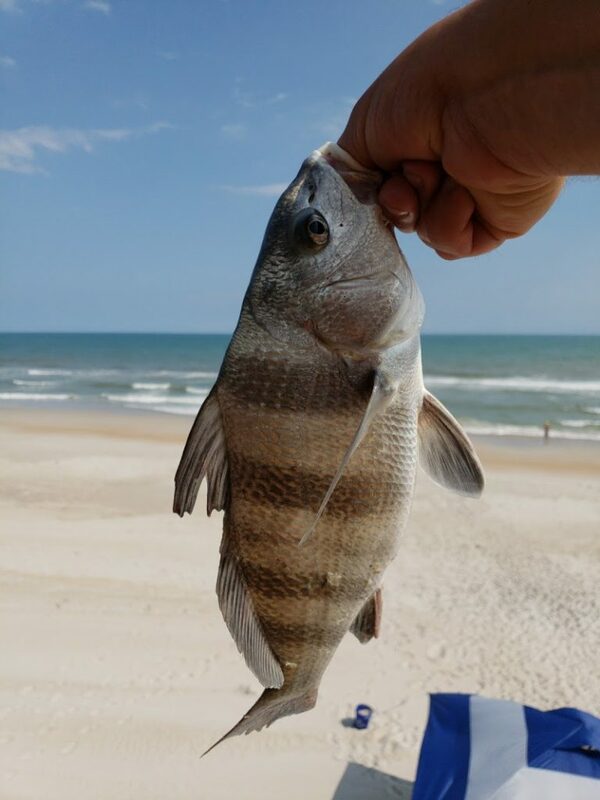 In the surf there are plenty of pinfish to steal your bait and some spots when the water is calm enough. For spots I have been using a bottom rig with shrimp but bloodworms work as well, if not better. The water has been unseasonably rough the last 2 weeks with many deaths along the Carolina Coast. The fish don’t like it either but there is indeed the occassional 4-8lb black drum in the surf as well. 2018 has been a slow year overall; if you weren’t aware, the water froze in the rivers behind the island earlier this year, resulting in a massive fish kill. August 1, 2018: A 5.76lb Spanish Mackeral was caught at the Surf City Pier this afternoon! August 2, 2018: Beach is quiet, surf is rough, just caught a small ray. Forgot to take pic, but other anglers told me they have caught them as well. August 3, 2018: Intercoastal Waterway: Red Drum and Flounder. Just talked to a guy at Trailer Bar who had a fun day catching Red Drum and Flounder in the Sound. He used one of the many charters available in the area. The water was rough and he didn’t want to travel offshore, but did just fine. He opted to have his fish cleaned over at Surf City Seafood behind The Crab Pot restaurant. A couple of nice Red Drum were caught over at the Surf City Pier in the AM. August 8, 2018: The Spanish Mackeral and Kings are here! Catch them on the pier, how bout that? 15, 20, 30lb King fish are being caught along with some really nice looking Spanish Mackeral. August 15, 2018: I got this Black Drum in the surf today on a shrimp in very shallow water. Also, mullet are biting sand fleas. August 26, 2018: Spanish, Blue, Pompano and sheepshead were all caught at the Surf City Pier today. Today’s water temp is 80. This concludes the August 2018 Topsail Island Fishing Report.